Share the post "Album review: JONAS LINDBERG & THE OTHER SIDE – Pathfinder"
Whenever I read the accompanying press handout on a new release and see the words “we wanted to explore our heavier side” – I always approach it with a modicum of trepidation, fearing that a fully fledged industrial hammerfest of what passes for ‘prog-metal’ these days is about to knock me sideways. And here it was – “we were aiming for a dirtier sound” and “we wanted something heavy” in the first paragraph of Jonas Lindberg’s press for ‘Pathfinder’, the Scandinavian’s third foray into the studio. Fortunately, my fears on this occasion were unfounded. Back in 2014 I reviewed Jonas Lindberg’s sophomore outing ‘The Other Side’ – a thirty minute EP of keyboard-led progressive rock which was very easy on the ear, but was all a touch too ‘safe’ and which I said at the time needed a bit of oomph. Well the ‘oomph’ has arrived and the whole feel of ‘Pathfinder’ could not be more different. Taking inspiration from fellow Scandinavians The Flower Kings, Airbag and even Katatonia the album is one of melodic progressive rock shot through with crunching guitar rifferama and soaring synths, Hammond and yes, mellotron. It’s a quantum leap forward and evidence, as if any were needed, that it’s possible to up the rock quotient of your music without burying the underlying melodies beneath a squall of white noise. The eight tracks get underway with ‘Square One’ whose unaccompanied flute intro had me thinking ‘safe again’ – worries dispersed seconds later as a killer riff kicks in and the scene is set for something very special. The keyboard-led classic prog of ‘Lost’ follows whose anthemic chorus gives full rein to the great complementary rock vocals of Jonas Sundqvist and Jenny Sandgren and is topped off with a fabulous wah-wah guitar solo. There are highlights aplenty in the remaining tracks – Lindberg’s mellotron in full effect on ‘Peace Of Mind’, the delicate acoustic riff of ‘Leaving The World Behind’, some lovely piano figures on ‘On The Horizon’, the jazzy chops and crunching riffs of the instrumental ‘Zenith’ (complete with some Cardigans’ ‘My Favourite Game’ guitar work) and the glorious harmonies and Gilmouresque soaring guitar of final track ‘Closer To The Sun’. The whole album is devoid of lowlights if I’m honest, being a fabulous melodic prog tour de force – great songs, great arrangements and sublime musicianship combining to produce one of the albums of the year. 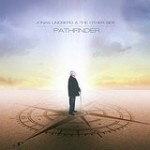 This entry was posted in ALBUM REVIEWS, ALBUM REVIEWS (Mobile), All Posts and tagged album, Jonas Lindberg & The Other Side, Pathfinder, prog, Progressive Rock, review, Sweden. Bookmark the permalink.